Just a moment... David has a thought: NoVa Code Camp Saturday! 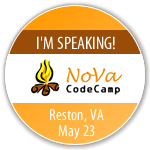 It's finally here - this Saturday, starting at 8am, is the Northern Virginia Code Camp (www.novacodecamp.org). Last I heard, registration is around 250 attendees. I just double-checked the schedule. My session, Intro to Composite Frameworks with Prism (now named CompositeWPF), is at 10:15.